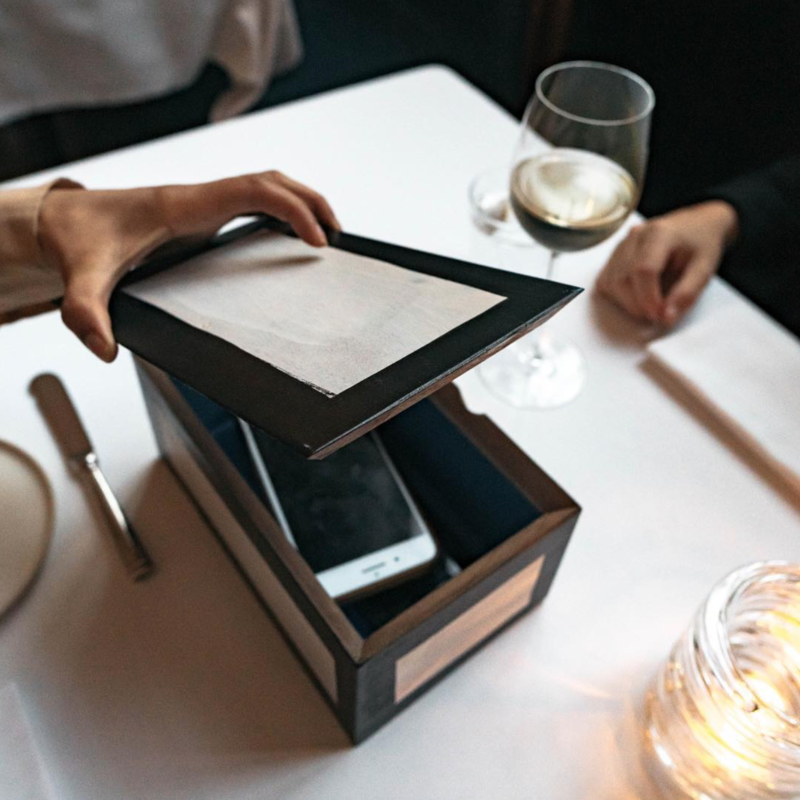 Triple Michelin-starred restaurant Eleven Madison Park in New York has begun to offer a new table service that invites guests to stow away their smartphones during the meal to resist distraction. Announced by chef Daniel Humm on Instagram, the move is aimed at encouraging guests to be “just a bit more present with one another”. The pic shows a smartphone placed inside a handsome wooden box on the dinner table. In his caption, Humm explains that the idea was inspired by artist Arlene Shechet’s art installation “Full Steam Ahead” at the nearby Madison Square Park which Humm – an avid art collector and connoisseur – interprets as an appeal to “look up and appreciate the present moment”. The installation is a series of sculptures that include a lion’s head and paw, bird feather and tree branches made in porcelain, wood, steel and cast iron, arranged around the perimeter of the empty reflecting pool. “Inspired by her exhibit, we’ve brought a touch of this into our restaurant, with guests presented with a box which they can place their phones into, encouraging them to enjoy the company of those at the table, and be just a bit more present with one another. It’s been so amazing to see how guests have embraced this in the dining room,” Humm writes. Shechet also joined in on the Instagram conversation to reveal that she had been working with Humm for months to design the boxes. While many of his fans applauded the initiative, others were quick to point out that stowing away phones would rob them of the chance to immortalise their US$315 meal on camera. The boxes are currently presented as an option and are not obligatory at the New York restaurant.